This article is part of the Dawn of War Player's Guide. 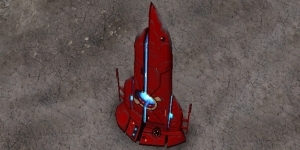 The building of this structure further pushes the Tau in their quest for the Greater Good. The Coalition Center allows you to requisition the Tau Ethereal. Be forewarned that the Coalition Center does not count as a production building towards the Annihilate victory condition, so you will still lose if this is your only building left. The Coalition Center gives the Tau access to the spiritual leader of the Tau forces, the Ethereal. It also provides the same support cap bonus as a Vehicle Beacon for the same cost, but requires a significantly smaller footprint. The Dawn of War Player's Guide - Thought of the day: Knowledge is power, guard it well.